How do I get started with NX? 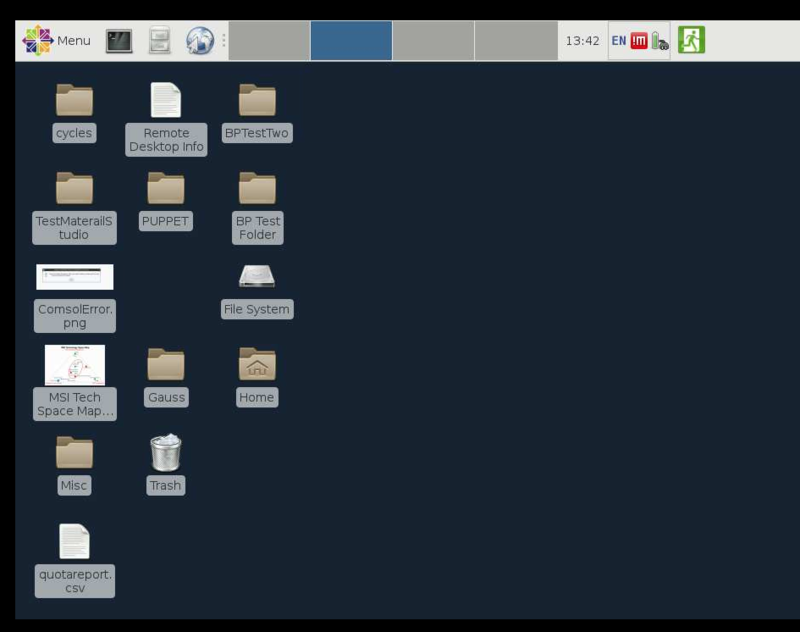 For years the X11 Window System (Xwin32/Putty on Windows, X11/Terminal on Mac) has been the defacto standard for remotely displaying a graphical user interface from an MSI workstation or cluster on your local client. The aged X11 technology provides a solid starting point for simple and lightweight graphical applications but struggles with many of the modern graphics-intensive GUIs that are available with many of the software packages MSI supports. The NX server/client system provides a modern, faster, and more reliable connection from remote Windows, Mac or Linux machines to MSI's constellation of Linux machines that span the various computational laboratories and core hardware. Unlike X11, NX transfers the complete desktop to your machine and provides a user experience much closer to that of working directly from an MSI Linux workstation. 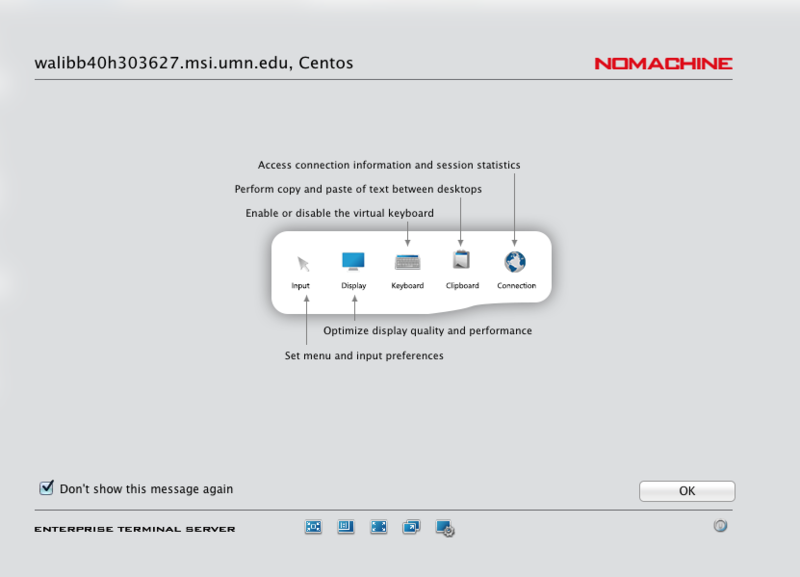 MSI runs the NoMachine NX server on nx.msi.umn.edu. Follow this guide to connect to NX on your computer. The screenshots shown below were taken on Mac OSX, but the process is identical on Windows. 2. 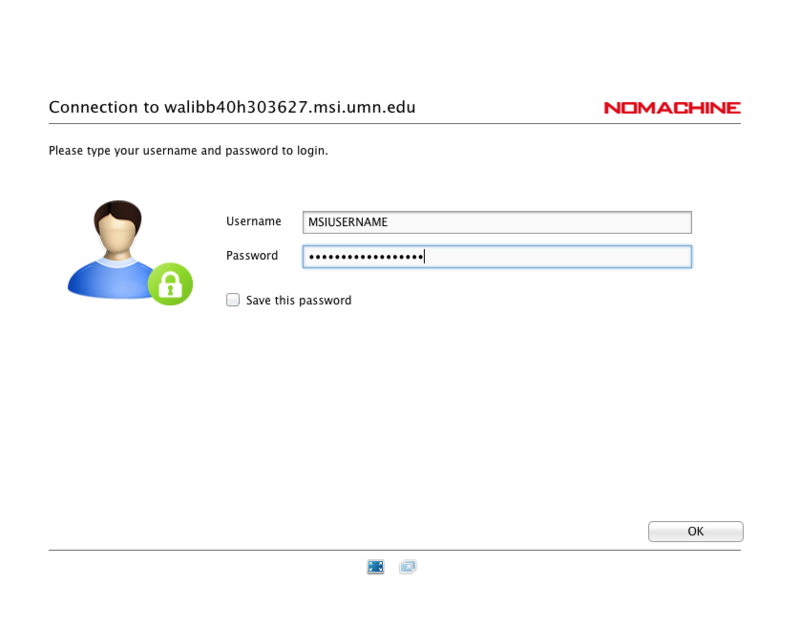 Login to NoMachine with your MSI username and password. 3. The first time you use the software you will see some information screens. If you do not want to see the information screens each time, check the box labeled "Don't show this message again". Click the "Ok" button. To prevent nx.msi.umn.edu from being heavily loaded, we do not allow users to run their processes / programs on it. nx.msi.umn.edu only provides a gateway for users to access other MSI Linux resources and supercomputers (but not lab workstations). Users can SSH to other MSI interactive nodes or use isub to run their processes. 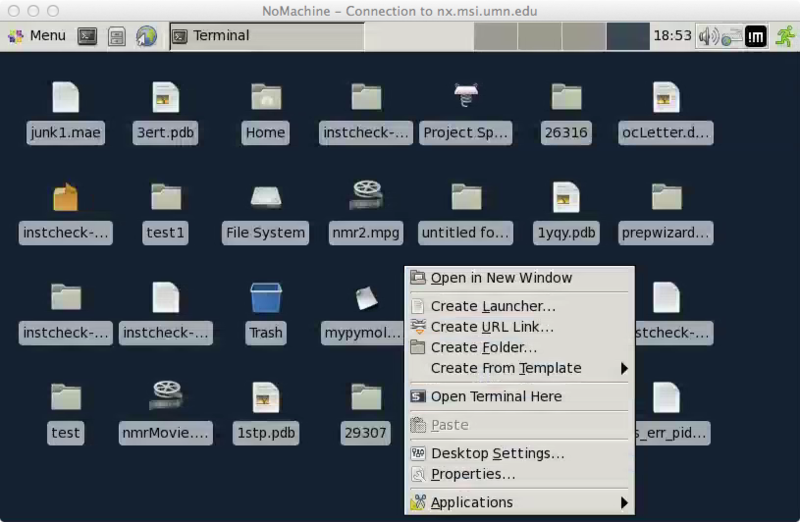 To do so, once you have used NX to login to nx.msi.umn.edu, open a terminal by using the menu that you obtain by right-clicking on the desktop (as shown in image below). In the terminal, you can type isub or you can type, "ssh -X username@machinename.msi.umn.edu”. Make sure that you replace the username with your MSI username and the machinename.msi.umn.edu with one of the MSI machines that you normally use, such as itasca, lab, etc. Press "Enter”. The terminal prompts you to enter your password. Copying and pasting text between NX and your desktop is done using the copy buffer on the bottom of the screen. In NX, after highlighting text by double- or triple-clicking a line, the buffer will pop up on the bottom of the screen. Text can be copied to or pasted from your desktop in this popup. Please contact help@msi.umn.edu if you have any questions.